The office of the Dean of Students is launching a new campaign to combat hate speech and violence. Following heinous events like mass shootings, heavy political discussion or hate speech, students can be left wondering where they fit in and what can be done to ensure that such events stop occurring. 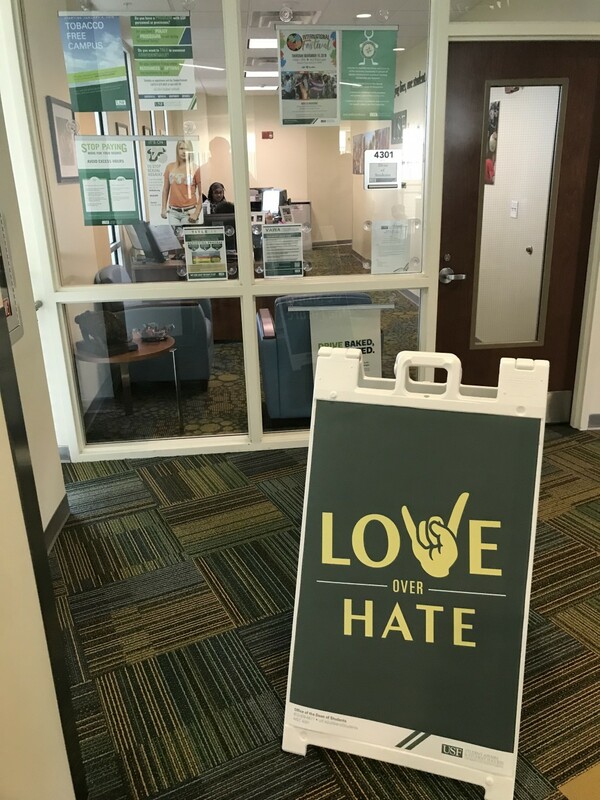 It is for that reason that the Dean of Student Affairs and Student Success Danielle McDonald created the “Love Over Hate” campaign. The campaign, however, is meant to be proactive, not reactive to a specific event. “We had quite a few weeks where there was hateful messaging going out on our own campus or across the nation,” McDonald said. “Every time something like that happens, students contact me and they want to know what is USF’s stance on it, what are our values? McDonald said the campaign has a couple of different aspects to it. One being to flood the campus with a message of choosing love over hate and that love can defeat hate. The second aspect of the campaign is to educate people on the programs and services available to members of the USF community. 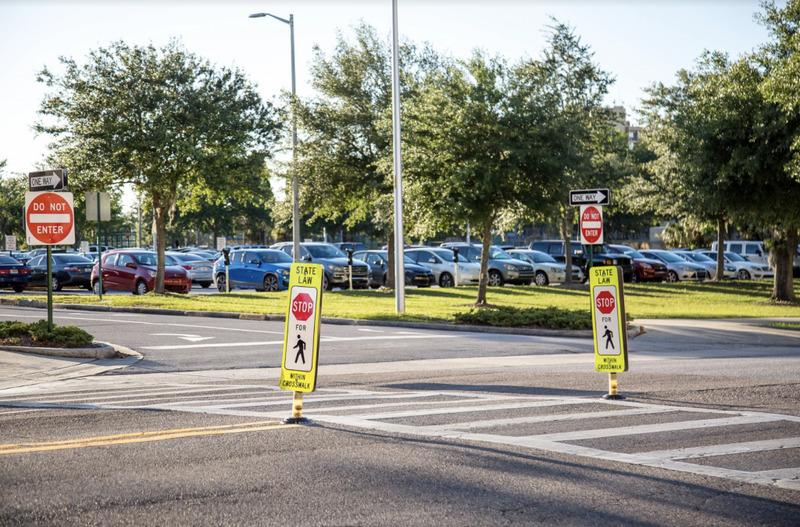 This is to help create a more inclusive environment on campus. The third part of the campaign is to create a workgroup in January. The workgroup will decide what education and resources are not available on campus but should be implemented. Students, faculty and staff are expected to be represented in the workgroup, including students who may not have an existing leadership role, but are hoping to add one. Some of the materials to help roll out this campaign are buttons, of which McDonald said she hopes “every student on the campus will have one,” as well as other forms of signage and flyers. McDonald said some of the outreach to students, faculty and staff will take place once a week in the atrium of the Marshall Student Center, where they will be passing out such materials and informing people of the new campaign and inclusivity. The Dean of Students office will be working with the office of Multicultural Affairs and the Office of Diversity, Inclusion and Equal Opportunity to completely roll out the campaign. Winston Jones, the associate dean of student affairs, said that in the weeks to come, student involvement will be a priority. However, it is not just about student involvement with new events, as Jones said the campaign is also going to be used to help promote existing events, such as the Abilities Dance — which brings professional dancers with disabilities to campus to perform and lead workshops with students and community members. For McDonald, it is not just about saying love is more powerful than hate but also taking action to prove it. “It is one thing to wear buttons and to talk about being allies and being inclusive, but the one thing we really want to do is create action,” McDonald said. She said that the campaign could also help those who are committing acts of hate. By her experience with students, McDonald said that in many instances, students are remorseful after they say hateful things and say that it is not who they are. Her hope is that when students who may have acted out of hate in the past, they will see the campaign and realize that they need to act differently. For those who truly have hate in the core of their being, McDonald said all she can hope is that the campaign helps to teach them to act with respect. “We can disagree, we can not like each other, but on this campus, we will respect the value and dignity of all,” McDonald said. Jones said that in terms of hate and violence, he hopes the “Love Over Hate” campaign will help bring people together. McDonald echoed those points and said in the end, it all comes down to respect and inclusiveness. “We want to have a louder voice than those voices of hate,” McDonald said.